Yummy VIP Wellness Day for you Mama with Dr. Monika - ND, Yoga Nidra Facilitator and Mama Mentor at the Banff Springs Spa. This 7-Day Retreat is for women who want to stress less and live more. For women who know that health, happiness and connection to Self are the foundation of fulfillment and joy in every area of their lives. This retreat is ultimately to nurture the most important relationship in your life … the one you have with YOU! We hear a lot these days about the importance of self-care and this retreat is a deep nourishing dive into replenishing, reconnecting and reseting. This retreat offers various yoga practices specializing in the restorative practices of yoga nidra and yoga therapy and the empowering, elevating, playful practices of Kundalini Yoga and Booty Dance. We will be reconnecting with our authentic self through nature connection, art, meditation, journalling, movement , beauty and joy. Picturesque Xinalani Eco Yoga Resort, on the warm and nurturing Mexican coastline, is the ideal location to take a week for yourself. And the last week of November is THE perfect time to step out of the cold and pre-holiday busyness. It really is a powerful time to address our needs for pausing, reflecting, refreshing our energy, reconnecting with self, deep rest and play. One of the many yumminess factors of this retreat is the food. The fresh fruits and vegetables and the healthy, delicious gourmet meals that await you! Xinalani is known for the exceptional food they serve. With a menu designed especially for health conscious yoga-loving people, they offer gourmet vegetarian and non-vegetarian Mexican meals. YUM! Renew your connection with your authentic self and your heart of joy. There are many paths to deepen your connection with your authentic self. This is the playful, powerful, joyful, creative, feminine path. We believe that our felt sense of joy is the voice of our authentic Self guiding us and leading us to becoming masters of our own nourishment, health and happiness and that self-love and kindness are game changers. The environment and retreat activities like the yoga, art and dance will be creating conditions for us to access this voice of joy and extend our loving heart to ourselves. Arrive and be taken care of. With the staff at Xinalani taking care of our needs, attention and care can be directed to our own replenishment and desires! Release old stress, replenish your energy, reconnect to yourself, gather with like-minded adventurous, heart-centered women and get inspired … feel fully alive and lit from within. As women in creative and care-taking roles we carry a mental load of to-dos day in and day out. It can be difficult to hear our soul’s whispers above the have to’s and gotta do’s and what do I cook for dinner and who needs to be driven where. We can lose connection a little or a lot to ourselves and our sense of joy amid the busy. This retreat is a reclaiming and deepening of our connection, of our radiance. Let’s reawaken and reconnect to the joy, peace and playfulness that is at our center. You’ll leave with simple practices to keep this beautiful deepened connection alive so your clarity and confidence and beautiful heart can continue to flourish and shine through. Waking up to the sounds of nature and looking out into the expanse of ocean and sky. Feeling lighter and clearer as the nervous system lets go of tension. Letting go of beliefs that have been draining your energy and putting a strain on your adrenals and your ability to create. Feeling the freedom of reconnecting with your body in a deeper, playful way. Letting nature reflect your beauty and strength back to you. Return to a rich simplicity. Feel free to bring something that you enjoy doing or are working on - for example some of us will bring our guitars. There will be free time you can use it as you like. There will be some live music surprises during our yoga-ing. Dr. Monika is trained in acupuncture and there will also be the opportunity during the week to experience a special healing group yoga nidra that includes acupuncture. Bliss! Xinalani translates to “seed” and we will be planting and nurturing the seeds of connection and care for ourself, presence and joyful embodiment through activities including these various types of yoga and mindfulness practices as well as right brain artsy soul inquiry activities such as collaging and poetry. Drop the roles that define your day to day life. Experience the deep rest and life changing gifts of daily customized yoga nidra. Re-energize your mindfulness practice so you can come home feeling more calm, centered and confident. Who is this especially for? 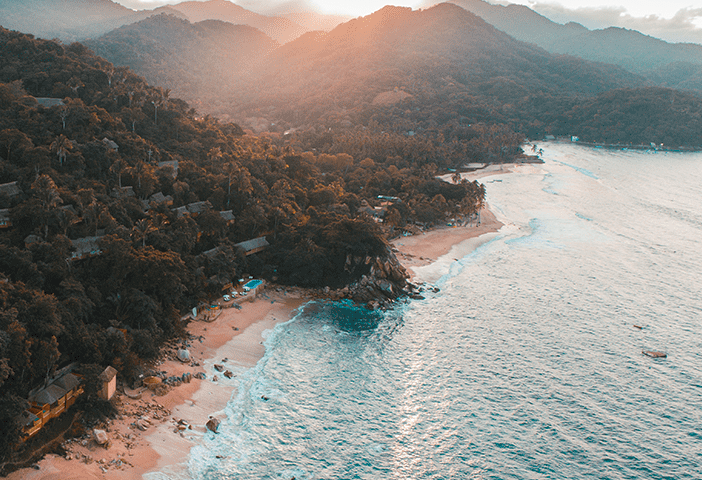 Really anyone’s life and health will benefit from nourishing self-care, personal reflection and reconnection and spending time in such exquisite beauty as this Mexican coastline! We do see this being a real game changer for women in their 30-50s, mothers, health care practitioners, entrepreneurs and any woman who spends most of her time caring/attending to other people’s needs or is transition in some area of her life and would like to tap into renewed clarity and confidence. From a women’s wellness point of view we will be choosing practices that will be supportive in restoring adrenal health at a foundational level. This impacts health and happiness, ability to meet life’s challenges with confidence and ease not to mention gut health, energy, patience & libido and how you go through the menopausal years. No yoga or meditation experience is necessary as we can modify for your level. warmth of that ripple out to your life. There will be spacious free time every day for you to fill or not fill with whatever your heart chooses. There are options at the retreat and near by for both adventure and relaxation. Swimming with dolphins, surf lessons, hiking to a waterfall and SUP are all possible as is spending time at the ocean or pool side: journalling, playing guitar, reading, walking barefoot in the warm sand, playing in the water, getting a massage or simply. doing. nothing. Kayaks, snorkels and boogie boards are available at no extra charge to use as you like. Remember the YOU beyond the daily roles. Your retreat facilitators will be Dr. Monika Herwig ND, Dr. Zhiish McKenzie MD, special guest, and the amazing staff at Xinalani. Dr. Monika is a mother, yoga teacher, nature lover and runs a naturopathic practice focussed on Mind-Body Health and Women’s Wellness with a specialty in Adrenal Health, Detox, Gut Health and Mindfulness/Yoga Therapy for Mental/Emotional Health and Feminine Leadership. She has facilitated wellness programs, cooking workshops and retreats since 2000. The expectation is for this to be a technology free week. This is an opportunity to leave the busy and create space to listen inwardly and be present here in mind as well as body. If you have a commitment to connect daily for example with your kids then yes of course do that but the intention in this retreat is for us to as much as possible unplug. RETREAT BONUS FOR MUSIC/DANCE LOVERS! 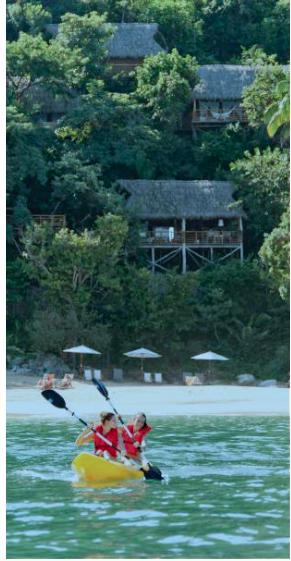 All-inclusive packages start at the early bird shared accommodation price of just $ 1495 US and include 3 healthy gourmet meals/day, shuttle to and from the airport in Puerto Vallarta, return 20 minute boat ride to Xinalani, 7 nights deluxe accommodation, daily yoga and mindfulness classes and other retreat activities . Our lovely retreat planner Cathy Wassermann is looking after you and the booking logistics. She can be reached at cathywassermann@visiontravel.ca. You can fill out the form below and send it to her or contact her directly. $500 reserves your spot and she can help you find a good flight and answer any questions you may have. To have your pick of the accommodation option you would like, reserve your spot sooner than later. There are limited rooms and the retreats at Xinalani seem to have a habit of filling up. We will be taking advantage of this nature’s paradise and bringing practices into nature as much as we can. Everything is designed with the intention of replenishing your adrenal reserves and nurturing connection with the all of You. Where joyful and fun meets soulful and sacred. She Shines 2019 Internatonal Event. The time you take for your own healing as a mom and caregiver is priceless. The fresh air, forests, mountains and rivers (and just getting away) give us fresh perspective. This is a container for you to reconnect with yourself, reset and feel supported. Come and recharge with like-minded colleagues (soul sistahs!) and leave with potent tools to support you and your children as well as your patients. This is for you if you are invested in parenting consciously and having more JOY and less tension in your life in general. My intention is that this has a 'come-as-you-are-pyjama-party' feel. It's all about you - no need to impress anyone about anything here - fully let yourself relax and let go. This retreat will attract amazing women ... you will be in great company. Motherhood and Entrepreneurship are two of most intense paths for personal development and creating time to reset and a sisterhood to support is essential in avoiding burnout and other health issues. Recharging with a retreat is like putting money in the bank. When you invest in your own self-care and empowerment and joy you are doing far more for your children than any money you are putting away for them. Gosh I know I am speaking to the choir - we talk self-care with every patient - but honestly how filled up are we keeping ourselves. Your children thrive on being with the unstressed, present you. It is easy as NDs and mothers to feel like we have to have it all together all the time and our energy often flows predominantly outward towards those we're caring for. This mini-retreat is a place and time to direct all that caring inward to YOURSELF within the container of other women who share similar passions and values as you. If you are a mom or work with them you know that giving without receiving is not sustainable. The time to nurture you is ... now ... possibly even yesterday. lol Taking time to be still and fill ourselves up is so essential. One big piece of the retreat will be to experience the different ways we can bring Yoga Nidra to ourselves, our mama clients and children and their families starting preconception. Yoga Nidra is a simple, lying down/seated guided mindfulness mediation that any of your clients can do to empower them to put themselves tangibly in touch with their own healing forces. Nidra will make everything else they are doing with you be more potent. I have been sharing Yoga Nidra in group with the moms here in Canmore, with my clients 1-on-1 and with moms on the West Coast and the feedback has been incredible. Nidra is so inline with our Naturopathic tenets - it covers them all actually - including true teaching and empowerment of our clients and addressing the root cause. Here's the low down for you. I have been very fortunate to take the Amrit Yoga Nidra Facilitator 10 Day Program, and the week-long Advanced Training. I paid around $5000 to complete and attend the trainings and needed to take 3 weeks total off work. It was a big commitment and I have fallen in love with it for myself and the population I work with. Yoga Nidra is such a good fit for NDs but I know how hard it can be to get away for long periods of time (especially when the kids are little) to do this type of training. I am breaking it down so you can have the key pieces of my learnings that I found most practical and beneficial for you as an ND, for your children and your patients ... and get deeply nourished yourself. Cost: $297 before May 13, $347 after. Pay only $247 each when you bring a friend! If this calls to you register early to take advantage of the savings. E-mail nourished@opentowellness.ca for more information or to pay by e-transfer! Yummy Organic Nutritious Suppers will be provided! 3 Mama Specific Yoga Nidra Tracks for you to use and freely share with the moms and kids in your practice. You'll be able to use them right away. This Yoga & Learn is to support ambitious, successful women and mothers light up the world without burning themselves out. We will learn practical ways to connect with the untapped gifts of our feminine nature for more balance, play, fulfillment and joy in work and mothering. Why this is game changing …. Men have VERY different hormonal rhythms than women. This may seem obvious but what isn't commonly recognized is that most women are working in accordance with the male hormonal rhythm ... in leadership, work and in mothering ... basically in life. This is costing us our health, joy, spark and confidence. As a Naturopathic Doctor who supports women with low energy, overwhelm, menstrual irregularities, anxiety, PMS, peri-menopause imbalances (and other symptoms of the adrenal glands needing help) I have seen that this road leads to burnout. It is just not how we are made. This evening Yoga & Learn with Dr. Monika will introduce you to the gifts of the feminine and of our cyclical (non-linear) hormonal nature. You'll learn how to work with your menstrual cycle or the lunar cycle in a practical, simple way that informs the other aspects of your work, mothering and life so you can enjoy a more easeful, healthy and sustainable way to share your gifts and shine your light in the world! And if you have daughters you can pass on this wisdom to them! Not having a regular period for whatever reason? Still come! Your nature continues to be cyclical whether you are still bleeding regularly or not. EASTER STORYTELLING WORKSHOP! GIVE YOUR CHILD SOMETHING FROM THE HEART THAT THEY WILL LOVE. This is for parents, daycare providers and teachers. Learn the gems of Storytelling for young children and leave with a pretty darn special Easter Kite Story Puppet Play to share. Children (and adults!) love this one. The Intention of this Program is for women to reconnect with themselves and their soul spark. It is a wellness adventure/journey = inner and outer for women ages 35 - 54 to rediscover their hearts desires and course correct their lives towards living soul-aligned, peaceful and free. This 2 hour course will teach the Fear-to-Possibility Technique also known as the Overwhelm to Ease Process. A quick, empowering way to get to the heart of what is going on with your client who is stuck in a certain area of their life, and to shift. It is a simple, safe, yet potent process to connect individuals to their own wisdom and support emotional and adrenal gland health. It is a body centered, grounded process that in a short period of time (less than 10 - 30 minutes) creates the space for the client to move from stuckness/overwhelm/indecision/confusion to clarity and next step. From a TCM perspective it re-establishes flow and energy. It is great for coaches, coaches-in-training, NDs and other growth mindset wellness practitioners/entrepreneurs who work with mind, body, and spirit and would enjoy another tool to (as needed) support energy shifts and growth for their clients. Space is limited. To have a conversation to see if this would be beneficial for you to take text Dr. Monika at 403 678-7901. This Package includes two 6 week Naturopathic Nourished Mama Project Programs and extra support and trainings along the way. The whole program starts February 14th and goes till the New Moon on June 13th. J.O.Y. (Journey of Yes) Home and Heart Alignment Process - 2-3 hours of a de-cluttering process that healthifies your home, deepens your connection to your intuition and heart and leaves you with a space that makes you smile! (value $297) OR 1 hour Naturopathic Consult (value $165). There will be a Private Facebook Group to share resources as well for those of you who would benefit from that. If extra naturopathic or coaching support is needed/desired participants will have a 25% discount to apply to these for the duration of the program. Space in program limited to 6 women. Systems are key for motherhood! Why? Because nothing drains our energy mor than a scattered mind and home and life. Rocky Mountain Restorative and Empowerment Retreat for Mamas in Transition or on the Edge of One. Regardless of the nature of your transition - whether it is tied to work, relationship, sense of purpose, an internal shift in consciousness or just a feeling of "something needs to change! ", simple practices that keep you grounded and centered and allow you to be buoyant in the face of change and uncertainty are potent. This retreat is a "come as you are pyjama party" - a place to relax, recharge, learn, play and create the space for your own wisdom and the wisdom of your fellow mamas to emerge. You will leave the weekend with basic tools to nourish yourself daily and to support you in creating a foundation of wellness in your day-to-day home life. These tools can give you traction in regards to 3 common challenges mamas come up against and support you through these during this transformative time. The practices are simple and not only acknowledge the reality of being a mama but work with the gifts of that and create a home life that nourishes. The practices are for working and stay at home moms alike and take into account that this is a very full time in your life. A care package based on the teachings and practices will accompany you back home. Includes Mindfulness, Yoga , Expressive Arts, and Mind-Body Wellness Foundations. * Discover the practical ways the state of your Chakras is influencing your energy, emotions, physical health and your relationships ... you will learn how they are linked to your hormonal system and nervous system and why women benefit from knowing how they work. * And what you can do to support their function and thereby affect your energy, health and happiness in ways you may not have thought of! * Experience and take home simple tools to support the health of each of your Chakras as needed. Note: Portion of Program Fee is eligible for Naturopathic /Extended Health Coverage. E-tranfer payment to doctormonika@opentowellness.ca or bring cash/chq to first class. Drop-ins possible - text 403 678-7901 to check in. Feeling overwhelmed, irritable, gaining weight around the waist, having headaches, worsening PMS, tight muscles ... even digestive problems can be a sign "Momstress" is getting to you. Motherhood can be a full-on time and when the tension is greater than relaxation stress happens. Overtime this can take a toll on our health, hormones, mood and basically our ability to enjoy ourselves on this uber precious (albeit challenging) journey of parenting. This series is a deeper dive into how you can use Yoga Nidra for you and your children to feel calmer, healthier and happier. *FYI - Yoga Nidra is a simple, guided series of mindfulness exercises (breathing and body awareness) that are strung together to bring you into a restorative brainwave patterning state where healing happens optimally. 30 minutes is said to be equivalent to 4 hours normal sleep. Experience 6, 30 minute-ish Yoga Nidra Practices with the group (group practice is more powerful than individual for many and positive changes have been noted on brain scans after just 11 hours of yoga nidra) . Learn how to use this easy, can't-do-it-wrong Mindfulness meditation (I'm talking about Yoga nidra!) on your own to get the most benefit. Receive a passcode to have access to a compilation of Mama Bliss Yoga Nidras to download onto your devices. Understand your child's unique consciousness and how knowing this can transform your parenting - brain neuroscience translated to the practical day to day. Use Yoga Nidra to get clear on difficult decisions. Share in the Sistahood (this should be at the top of the list!!!). Oxytocin (AKA - the tend and befriend hormone) is the female anti-stress hormone and flows abundantly through us when we get together like this! Where: Mountain Pod Yoga Studio in Canmore on Bow Valley Trail. Class size limited to 6. When: 6 Wednesdays, November 14, 2016 to December 21, 2016. Classes run 10:15 am - 11:45am. Bring eye pillow (if have one), yoga mat, journal and something to write with. Cost of Program: $147 which can be e-transfered to growingmamalove@gmail.com to reserve your space or by paypal. A Morning of Healing Mantras and Songs to learn and bring into your day to Nourish you and your Child and cultivate Joy in your home! Where: Mountain Pod Yoga Studio. 8:45 am to 10:15 am. Due to space limited to 6. "Present not Perfect" is the overall Mantra for this --- see write-up for details and hope to see you there! In this 6 week Soulful, Conscious Parenting Program you'll be learning some pretty cool foundational concepts to help you understand your child's brain development (emotional and mental) and his/her changing consciousness so you are more able to truly meet him/her in the moment and nourish your connection with each other. More understanding translates to more ease and joy (and less frustration) day-to-day. YES! (-: Yoga Nidra is included in every session. The short answer is that each week you will be guided as a group through a 35 minute lying down Yoga Nidra * meditation and the remainder of the time will be a mix between education, various experiential exercises/reflections based on the concepts, and of course sharing (as people wish). *FYI - Yoga Nidra is a potent mama friendly sleep based meditation tool that supports the free, beautiful flow of your own and your child's self-healing forces by a series of breathing and mindfulness exercises that bring you into the brainwave/nervous system state where healing happens optimally. As a bonus (!) old beliefs that aren't helping us can be transformed here helping us rewire our brain so it is easier for us to live a more conscious life that is aligned with our own values and heart desires. Learn and experience my favourite, seriously efficient process for taping into your body's wisdom for guidance when you're feeling overwhelmed or stuck. Learn from my experience what the single most important quality in the mindfulness journey for moms is. Learn my favourite one-syllable magical word to bring into your parenting and hear how my daughter is using it with our new puppy and how it ties so well into the above most important quality. Access to laser Coaching as needed and time allows. BONUS: a complimentary story-based Yoga Nidra audio recording for you and your children to go Zen together with. Why this Program and the Content? If you are INSPIRED and able to join some other soulful, heart-centered stay at home moms and mompreneurs we'd love to have you. We start the Fall 6 week session next Wednesday September 14th at 10:20 am at the Mountain Pod Yoga Studio in Canmore on Bow Valley Trail. Class size limited to 6. Cost of Program: $147 which can be e-transfered to growingmamalove@gmail.com to reserve your space. This 8 Week Mindfulness training course is for you mom if you are ready to live motherhood with intent and make your peace of mind and happiness a priority. If mama ain't happy nobody is happy. There's so much we bend over backwards to give our children but everything pales compared to the gift of our own well-being and presence and joy. Motherhood isn't necessary the time for an on-the-cushion lengthy meditation practice - its more like a 24 hour spiritual bootcamp! Simple changes make huge differences and taking time-out to recharge with like minded mamas nourishes the whole family. You will learn and practice simple mindfulness exercises and breathing techniques that can increase your patience, raise your happiness set point, decrease stress/anxiety and basically bring back that fun-loving, light hearted you! Each week you will integrate another one of the 8 Pillars of Peace into your home life so that after the 8 Weeks you have a solid foundation to continue to thrive from. This course is designed with the needs of parents with children birth to 14 years old in mind but all parents are welcome. Mindful Eating: Eat Better, Feel Lighter NEW! Eat Better. Feel Lighter. Live your life in a healthier body! Mindful Eating: 4 Week Holistic Nutrition Course - Tuesdays 5:30 - 6:30pm. Starts September 16. This course will give you the fundamentals of good nutrition and help you make sense of all the info out there on what is/isn't a healthy diet. We'll work together to implement simple changes to affect big changes in your energy, clarity and body composition. There will opportunities to experience new, yummy foods to bring to your table and your life. Healthy Mamas, Healthy Kids NEW! This 8 Week Mindful Parenting Course is designed to help us transform stress, and build joy and resilience in our day-to-day lives. This course is designed for moms with children birth to 6 years old - course is for moms(babes in arms welcome). This course will provide tools to empower us to meet our days, ourselves and our families with our authentic joyful, present selves. You will learn about common practices that are being found to increase and decrease stress for kids, about your adrenal glands and how to nourish them, the benefit and tips of healing storytelling for you and your children and much more. We will practice meditation and yoga together and work practically to bring more peace and simplicity into our homes and our lives. Start your fall empowered, calm and clear. Babes in arms welcome. Childcare services available through Elevation Place. Instr: Dr. Monika Herwig ND, Naturopathic Doctor, Mind-Body Wellness Educator. Feel confident using essential oils with your family. Sept. 30, 2014 7:30pm - 9:00pm. $25. Dr. Monika Herwig offers these Waldorf-inspired Fairy Friday mornings to nurture our children's connection to themselves, local plants and animals, and each other through time in nature, imagination, story and art. Will learn about the local medicinal and edible plants in a magical way. * Fairy Fridays start up again in the Fall. Only 5 spaces available. Nature and Waldorf-inspired 4 Day Fairy Camp for 5 - 8 year olds. Will include elements of yoga, local herbs, storytelling, water-colour painting and other arts and of course lots of time in nature with the fairies. To register, send a non-refundable deposit of $90 to inspired@opentowellness.ca with the age and name of your child. As of July 7th there are 2 spots left. Sending you Butterfly Kisses and Sparkly Wishes on this warm, wonderful Summer day. Storytelling is one of the top skills I encourage parents to bring to their parenting and family life. It is invaluable in creating that deep emotional connection with your child and in bringing you out of the hurly burly and into that juicy nowness with your child. In our busy world storytelling offers both child and parent a nurturing breath. You will learn simple tricks of the trade that will enrich your experience as the teller and your child's experience as the listener. Come out and play with like-minded mamas. Knowing Your Own Temperament and Your Child's/Student's Temperament is indeed very helpful. "That's soooo cool!" is the response I had and the most common response I hear when I bring this information to parents and teachers. It's not complicated and has a huge impact on relationship. Sometimes not understanding our child's temperament finds us in a state of blaming and an "us - them" dynamic - we feel disconnected and frustrated and whatever we do seems to make things worse. Each temperament brings gifts and understanding them can help our children and ourselves in very practical day-to-day ways. I have seen this increase connection and ease. Temperaments have been used in medicine for hundreds of years as well as nowadays in the workplace to determine suitability for jobs and to help teams work together more efficiently and harmoniously. Knowing the temperaments can have a huge positive impact on your parenting and teaching (how to tweak discipline for example to meet that temperament) and your relationship in general as its a glimpse into how they and you see the world. Join us for a 2 hour experiential art workshop on the temperaments. Great workshop for teachers/parents with children 5 – 14. A 2 hour session where we explore and set free through creative writing, conscious movement and light hearted writing exercises that soulful part of us that yearns for expression, connection and to be nourished in this way. We will delve into the potency of poetry as a healing art and a doorway to the present moment, cultivating gratitude and living authentically. Each class will begin with some centering/mindfulness exercises. Bring a journal, your favorite pen, a camera and a sense of play. Cost : $45 per person, $60 when you bring a friend. Let’s get organized for Summer! It's a good feeling isn't it when something happens - a cut, scrape, headache, car sickness and you've got some tools to pull you through a bit more gracefully. And it's equally frustrating when not having some wipes and a bandaid turns something pretty simple into a bigger deal. "Sometimes just looking after ourselves and trying to stay calm is all that is needed to transform the event from trauma to hiccup or "challenge" that we got through - some deep breaths and Rescue Remedy and giving my children a hit of Arnica 200CH on the way to Calgary Children's Hospital have kept some grey hair at bay! " Bring your First Aid Kit along or if you don't have one throw it all in a ziplock bag and come join us. We’ll talk about the basics and some naturopathic and homeopathic favourites to have on hand. Bring a basket if you have one as there will be the opportunity to make a healing basket for your home use. Forest medicine will be discussed as well. 9:30 am – 11:00 am – Alpenglow - outside weather permitting. *Naturopathic nutritional tune up (& tips for family cleanse – all can benefit from a yearly cleanse). * Simple Mindfulness Movement and parenting gems to de-clutter the mind. * Reclaim your home space using principles of Rudolf Steiner (Waldorf-inspired) to de-clutter and awesomefy your home. * Share tea and great company. Snacks from Tasty Life Foods. Cost: $120 , $110 when you bring a friend. *Mothers of all stages and ages are welcome. Dr. Herwig has the expertise to modify the nutritional component of this program for pregnant and nursing mothers. Some childcare is available if booked at least 1 week in advance. Duration: 1 hour but can be more or less depending on you. Cost: $20 per adult - kids free and this time your partner is free too! Kids love to experience nature through all their senses and we're so lucky in Canmore to be able to offer this to ourselves and them - we'll learn how to make salves, dandelion honey, immune teas and much more and what is and isn't safe to eat and when. To register e-mail monika@opentowellness.ca and send e-transfer to this email. You must let it find you." Meet at the entrance to Larch Island in Canmore for an herb walk ~ $20 per person. If register before June 25th you can bring a friend or your family for free!